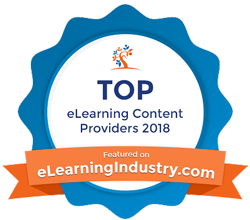 Designing Digitally, Inc. earned a privileged position on eLearning Industry's list of the Top 10 eLearning Content Development Companies. eLearning Industry evaluates companies on multiple criteria including development quality, expertise, innovation, customer reviews and retention, and employee turnover. They reviewed over 400 companies to identify the best firms in the business. eLearning Industry uses the list to recognize companies who have pioneered eLearning strategies as well as to help corporations make an informed decision when choosing an eLearning development partner. For security reasons, please answer this math question in the box below: 8 + 2 = ?